Stunning Aquamarine Jewellery | Rocks & Co. The Aquamarine gemstone is a very valuable member of the Beryl mineral family, making the jewels featuring Aquamarine true gifts of nature. Aquamarine jewels are collected and loved because of the incredible colour palate of the gems themselves. The quality and value of Aquamarine gems vary greatly. The incredible blues of Aquamarine range from pale blue to a blue-green to dark blue, with transparent to opaque stones. Blue-hued Aquamarine jewellery is perfect for this season's colour forecast! An Aquamarine cocktail ring, bracelet or necklace reflects the ocean, blue sky, and springtime and works with the playful colour schemes of the season. These blue gems play wonderfully with spring's bright primary colours like orange, yellow, and red. They also pair just as easily with the classic neutral colours that are always present in our wardrobes and lives. This gemstone rates 7.5 on the Mohs scale of hardness making this a great stone for many Aquamarine ring designs. At Rocks & Co. we are often asked on 'which finger' should wear your Aquamarine ring. Don't be put off, but the middle finger is actually a great spot for the oversized glamour of an Aquamarine cocktail ring. Cocktail rings have one job: to grab attention! Not unlike a single art piece in the centre of a gallery floor, to create curiosity, wonder and the start of real-life conversations! My Aquamarine ring sits safely in the middle finger of my hand. Last winter I found a trick where I twist the stone side of my cocktail ring around (if you have not already guessed, it is this reporter's new favourite ring) when putting on gloves, for more comfort. Spring is here. No twisting required. Everything done with your hands brings focus and a spotlight to your Aquamarine ring. Whether it is a popular pinky ring, or a more traditional friendship or engagement ring. Any finger is ready and right for the delicate colour of an Aquamarine ring. Hey, blue eyes! Here's a pair of Rocks & Co. Santa Maria Aquamarine stud earrings to go with your baby blues. Oh, and for your lovely sister with the deep black eyes and olive tone skin, we have got a pair of dark blue Aquamarine drop earrings to adorn her with as well! And you there, my ginger friend. These pale blue Aquamarine earrings are a dream with your colouring style! Maybe it’s time to self-gift an18K Santa Maria Aquamarine necklace. Like our beautiful pear-shaped cut stone, set in a halo of white pave cut Diamonds. Also, very popular in the Aquamarine gemstone necklaces and jewellery world are vintage art deco style pieces which have elegant and distinctive look reminiscent of that era. Yes, please! That's what you say when someone offers you an Aquamarine bracelet. If you are very fresh, you might query as to whether it is in the tennis bracelet or charm bracelet style. If neither, what style is it? Are the stones a classic pale blue or a dramatic deep dark blue? Transparent or opaque? What country and mine do the stones come from? The Santa Maria mine in Brazil, perhaps? 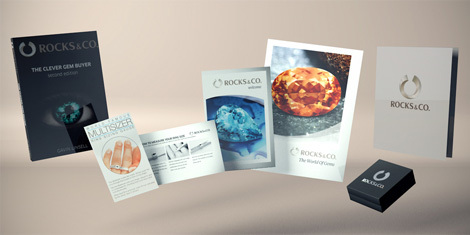 Is the jewel from a trustworthy, yet stylish, online jewellery company like Rocks & Co., perhaps? Aquamarine in gold. Is that a question or a statement? This gem and the precious metal combo are as old as the hills. Even the colour options go way back. There are Aquamarine jewels set in yellow gold and there are many sets in white gold, platinum, and silver. All options are win-win in an Aquamarine jewellery lover's world. It depends on your own preference and both are even possible combined in the same jewel. Of course gold brings the value and cost of your jewel up, making the combination a good investment. Aquamarine ring styles and choices can sit very prettily in white gold. The white of this precious metal serves as a gentle but strong reflection for the ethereal pale blue stone. Coupled with a classic cut, many Aquamarine white gold rings have design styles that tip a chapeau to the stunning designs of the 1930s Art Deco era. Known for its Emerald-cut stones and usually baguette cut side stones, it is the art of steps, and squares, and rectangles with rounded corners. A play of razor-straight lines with sensuous curves. The style was celebrated through interiors, exteriors, cars, fashion and more. Something borrowed and something blue. Although you may not want to return the Aquamarine pendant loaned to you after the wedding vows have been made, it will be the perfect addition to the white wedding dress, and the old and new bits of this particularly sweet wedding tradition. Aquamarine pendants set in white or yellow precious metal settings tells a delicately feminine, but strong, story. If you google the gem you see the glamour, and strength, of the women and men who have chosen to wear this jewel. Not unlike the Amethyst, there is something innately royal and glamorous about this jewel. Peruse the selection of Aquamarine pendants and jewels available at Rocks & Co. today!